Had my first JMU snow day on Tuesday. 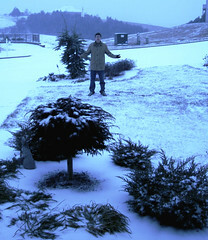 Here is a shot Jen took that morning with our huge blizzard of 1" (you can still see the grass). To be fair, we did get more throughout the day, but it was still a whole lot less needed to cancel classes than what I am used to.